This will be a very short post, but as I was checking out websites for my gluten free cereal suggestions, I stumbled along THIS site. 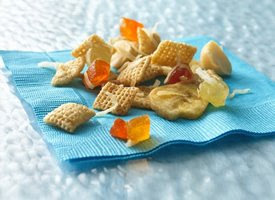 There are plenty of GF recipes provided by Chex here that might be great to bring along to you with a party. You know, those parties that, when you go to them, have no available GF food? Well now you can bring a GF chex mix with you.